The army of ancient Rome (800Bc—AD476) was a formidable fighting force — well disciplined, organized and supplied with an array of effective and battle-proven weapons. The sword and spear were the infantryman’s main weapons, and the spectacular military successes of the Roman legions throughout Europe and the Near East lay in the disciplined battlefield application and relentless training in the use of these weapons. A short stabbing weapon with a blade length of around 50—60cm (19.6—23.6in), the gladius was the primary fighting sword of the Roman soldier. Its origins are somewhat uncertain, simply because very few examples have been unearthed by archaeologists and the only identifiable gladii have come not from Italy but from Germany. This sword was described by the ancient Romans as the “gladius hispaniensis”, in recognition of a similar type of Celtic design encountered by the Romans during their conquest of Hispania (modern-day Spain) during the Second Punic War (218—201BC). Before this, Roman soldiers would have used swords of Greek origin. The hilt, or capulus, of the gladius featured a rounded grip, moulded with four finger ridges to allow a comfortable and firm hold upon the sword. Pommels were bulbous and normally of plain form. The scabbard was made of wood, covered with leather and strengthened by a rigid frame of brass or iron. 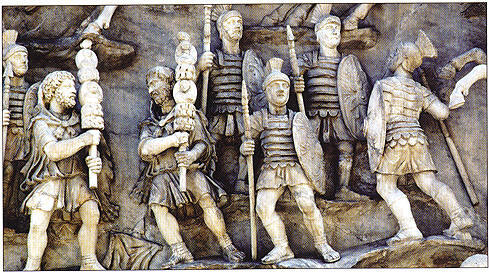 RIGHT: Legionaries, carrying gladius swords, are depicted during battle in a relief carving from the base of a column found at Magonza, Italy. Although in later centuries most swords would be worn traditionally on the left side, the gladius was worn on the right side. This allowed the wearer to draw with the right hand and at the same time carry a heavy shield in the left hand. This can be confirmed from the depictions of Roman soldiers on tombstones, wall paintings and friezes. The tombstone of Annaius Daverzius, an auxiliary infantryman who served with the Cohors III Delmatarum, a Roman garrison stationed in Britain during the 1st century AD, shows his sword attached on the right side of his belt by four suspension rings. As an acknowledgement of his status, a centurion was allowed to wear his sword on the left. If used with enough force and directed at the most vulnerable parts of the body, particularly the stomach, the stab of a gladius blade into the flesh of an opponent was nearly always fatal. Roman soldiers fought as a single fighting unit within an organized and massed formation. This fighting block comprised hundreds of men standing shoulder to shoulder. They had to keep this formation solid and it was crucial, therefore, that all soldiers fought with the gladius placed in their right hand. Any left-handed recruit would have this hand strapped behind his back during training, and it would be kept tied until he learned to fight with the right hand as well as he would have done with the left. Wearing the gladius on the right also meant that the drawing of the sword would not interfere with soldiers on either side, and would also not restrict the use of the Roman scutum (the shield). 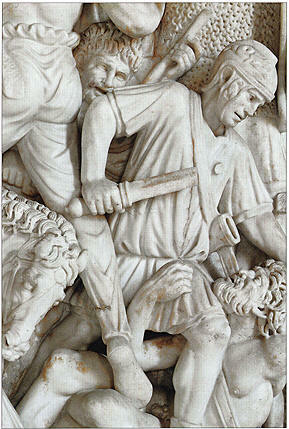 ABOVE: A battle between Roman and Germanic armies, depicted as a relief on a marble sarcophagus, C. AD18O—190. The Roman line would wait for the enemy to come right up to it and then await the order to advance. Upon receiving this order, all soldiers would take one step forward and thrust their shields, or scuta, into the bodies and faces of the enemy, causing them to lose their balance and so render them temporarily vulnerable. The shield was then quickly withdrawn and the gladius thrust into the body of the opponent. The Roman soldier was taught to deploy the gladius horizontally, so piercing the enemy’s ribs and penetrating to his vital organs. ABOVE: A gladius and scabbard, which belonged to an officer of Tiberius (42Bc—AD37), the second Emperor of Rome. 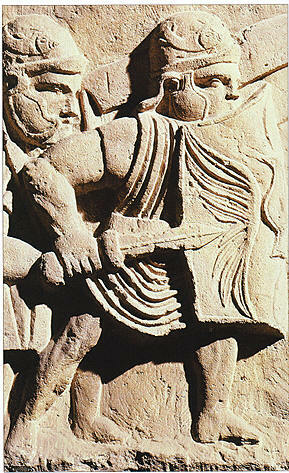 ABOVE: A stone depiction of the Emperor Hostilianus in a Roman battle scene, 251AD. He is carrying a gladius, of which the blade is broken. By the middle of the 1st century AD, the gladius had been replaced by the spatha (spada is the modern-day Italian word for sword). It had a much longer blade (60—80 cm123.6—3 1 .5in) and shorter point. The sword was Celtic in origin and it is probable that Gallic cavalry (from Gaul, in modern-day France), in the employ of Rome, introduced the sword to the Roman Army during the time of Julius Caesar (100—44Bc) and Augustus (63Bc—14). It was a slashing weapon and designed to be used by both the Roman cavalry and infantry. ABOVE: Found in Spain, this is the only known actual example of a spatha with an eagle-headed hilt. It would have been used by a tribune in the early 4th century AD. By the time of the Roman Republic (c.509—44BC), the use of steel in the manufacture of swords was well advanced and Roman swordsmiths smelted iron ore and carbon in a bloomery furnace (the predecessor of the blast furnace). The temperatures in these furnaces could not achieve the high levels required to fully melt the iron ore, so the swordsmith had to work with pieces of slag (residue left after smelting) or bloom (mass consisting mostly of iron), which were then forged into the required blade shape. These pieces or strips of cooling metal were welded together for increased blade strength. During this process the owner’s initials or full name were sometimes engraved onto the blade. Around 2m (6.5ft) in length, the main heavy spear or javelin used by the Roman Army was the pilum. It consisted of a socketed iron shank with a triangular head. The pilum weighed in at around 3—4kg (6.6—8.8lb); later versions produced during the Empire (27BC—AD476) were lighter. The pilum would have been thrown by charging legionaries and could easily penetrate shield and armour from a range of around 1 5m (49.2ft). A lighter, thrusting spear, the hasta, was also used for close-combat situations. ABOVE: Roman soldiers carrying light spears (lancea) and shields. 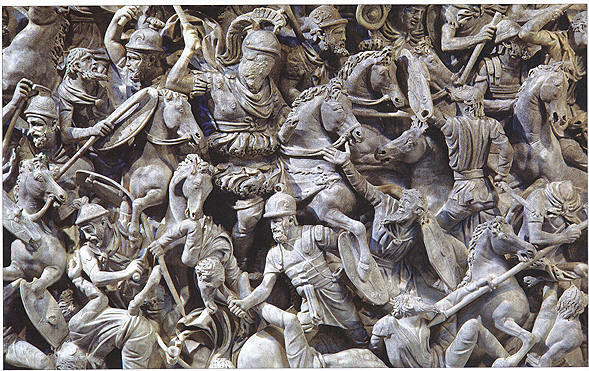 Detail of a relief from the Antonine Column, Rome, erected c.AD180—196 in recognition of the Roman victory in battle over a Germanic tribe. 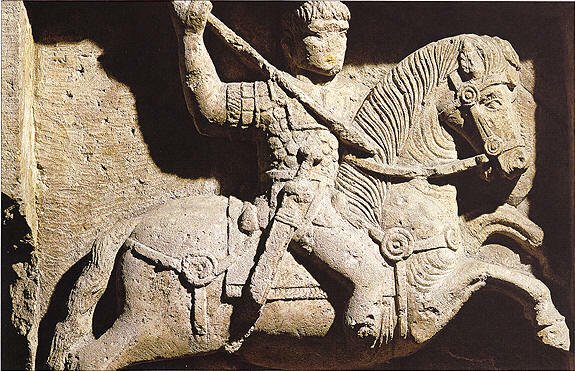 ABOVE: Dating from AD70, this inscribed Roman commemorative stone depicts a horseman (Vonatorix) wielding a spear. A long, wooden cavalry lance which was 4—5m (13.l—16.4ft) in length, the contos derived its name from the Greek word kontos, or “oar”, which probably gives some indication as to the length of the lance. It took two hands to wield, so the horseman had to grip his mount by the knees. To be able to do this effectively would have taken considerable strength and training. ABOVE: Made in the Roman provincial style, this contos lance head dates from the 2nd century AD.